Plus! 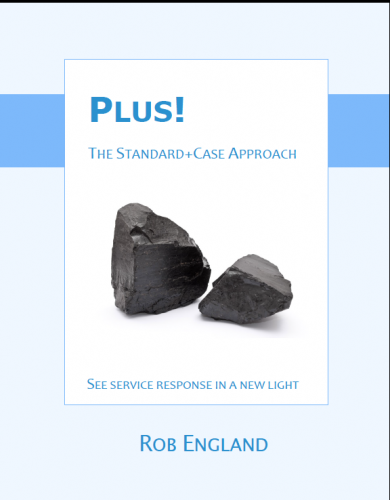 The Standard+Case Approach is the definitive handbook of the Standard+Case approach to service response. I know there is so much to read these days, but if you have anything to do with service support or change management, read this. It will change your year. S+C addresses criticisms of process-centric approaches to managing responses that they don't allow customers and knowledge workers to be empowered. And unlike some new-fangled theories, S+C does not seek to replace or change existing approaches: it expands and clarifies that theory to provide a more complete description of managing responses. Standard+Case applies to anything that requires a human response: there's either a standard response or there isn't. A short ITSMTV video interview on Standard+Case. More videos and podcasts here! The book is out now!! Apple fans please use the Kindle app on your iPad/iPhone. Contact me if this is an issue for you. Sorry the book will not be available in ePub format due to Lulu dropping support for DRM. Available direct from the printer on CreateSpace (a subsidiary of Amazon) - more revenue for me, thank-you! For the adoption of Case Management, there needs to be a climate of empowerment, trust, professionalism, valuing knowledge, respect for expertise, user-focus, and drive for outcomes. "Spend time with them understanding what they do and how they do it." Even for those readers who are already doing some, much or all of this, it is still worth browsing the material as there are lots of checklists and bullet-pointed ideas. For those not doing any of this, this book should be essential reading. This book documents Rob England's view of how IT organizations should respond to incidents/problems/changes/requests/events or anything else that needs a managed response. Rob argues that there are two distinct types of response, standard for predictable things that can be managed by following a process, and case for things that are complicated, complex or chaotic. He explains the different approaches very clearly and shows how using the combination of Standard+Case can lead to improved service. Reading Plus! The Standard+Case Approach reminded me of when I first read the ITIL books nearly 20 years ago. Yes, I thought, of course, this is exactly what really good IT organizations do to manage things. We pretend that we follow processes, but in reality there are many exceptions and trying to force these to fit a process model leads to poor service and dissatisfied customers. I will be using many of Rob's ideas as I work with my customers to help them improve their approach to IT service management, and I recommend that you do the same. Rob England's latest book Plus! The Standard+Case Approach, does in one short reading what many books attempt to accomplish in several years. S+C redefines the relationship for technology professionals by creating a route to customer experience, an improved skillset for ICT and redefines everything we thought we understood about "routine". Easy to read, effortless to consider, S+C brings a level of sanity back into the hyperbolic world of buzzword, out of touch, business related jargon. Slow down, this is one case you need to consider. practices and systems”. This is why everyone should consider S+C. If you're in the ITSM industry, or in any Service Management industry in general, you should do yourself a favor and buy this book. This is an important piece of work. Elegant in its simplicity and powerful in its message. Rob's humble way of explaining things comes through brilliantly, flawlessly. It makes you slap your forehead and mutter 'this makes a lot of sense' while your significant other looks at you puzzled. You want to leap out of your chair to do this. It re-frames everything you do around the concept of Standard+Case. There's either a standard response, or there isn't. I read this twice in a period of 4-6 weeks. It's that good. I'm glad that the Kindle edition stores my highlights and notes, because I fully expect to come back to them in the future. Give yourself a nice gift today and get this book. Get involved. Follow Rob on his Twitter account, and check out the presentations made for S+C in the global TFT12 and TFT13 conference (go to YouTube and search for them. Plenty of good content from other resources as well). You'll never look at responding to your clients in the same way again. Plus! does at least two things for the reader: it allows them to see the need for something more than the standard approach to incident management; along with providing much-needed practical advice on how to change the status quo. It's a good read and recommended to anyone involved in IT support and perhaps those involved in non-IT support. Are you prepared to become more effective? it's a must for anybody that wants to take the next step in support evolution. 1. Rob did an admirable job explaining his Standard+Case model in detail: how the model works, when the model is appropriate to deploy, why we should care, etc. 2. As someone with IT operations background, I believe Rob's advice and recommendations are actionable. Theories and high-level frameworks are good to know, but the rubber will eventually need to meet the road. I am convinced that Rob's approach can work for many IT organizations. 3. If you have had exposure to Rob's work via his blog, speaking sessions, or his books, you know Rob likes to call things as he sees them. This book is no exception. This is a good book. It can be read easily and I know. I read it during an eight hour flight to the US and got it in one. Truly insightful and informative. Love how @theitskeptic puts Taylorism in perspective (Standard+Case book): "Knowledge workers find process-centric approaches de-humanising"
By tying together the mature practices of ITSM and Case Management in his book "Standard+Case" Rob has strengthened and filled in gaps of both frameworks. I have personally gleaned important concepts and terms from this book that I will use in my IT Management Career from this point forward. A must read for ITSM professionals! Rob England’s (in)famous skepticism – tempered with observations over time – has produced "Plus! Standard+Case" a remarkably valuable, short, and concise book that has proved Rob more wise than he has ever been skeptical. The simple structure of the prose and logic make it a pleasure to read and an excellent reference for those for whom Standardization - while is a vast improvement over chaos - is becoming a constraint. "Plus! Standard+Case" explains the whys and hows of using Case methods to satisfy requests that cannot be satisfied with a standard response. Keep this book on a handy (virtual) shelf in “case” standard methods are no longer enough. The introduction of case management to ITSM is long overdue and after reading this book (and some other sources) it seems almost criminal it has taken this long for ITSM to make some use of this practice. Rob England richly deserves praise for throwing a spotlight on this neglected (by ITSM) corner of process management. The book does a decent job of explaining the theory – or at least, this authors theory of how one could use (and implement) case management. The concept of Standard + Case is fantastic, one of the more illuminating ideas about service management I have ever stumbled across, but this book seems to be out a bit before the idea has been fully marinated or tested. This is a great addition to the ITSM body of knowledge and ITSM professionals should definitely be looking into adopting Standard + Case principles into their processes. Great reading and concept. Now I want to build it. I like the small, though quite readable, introductions to topics one usually can't easily reference in the context of service management books, like the art of making and using checklists and organizational change management. Desde el momento en que Rob comenzó a hablar de esto supe que tendría éxito. No está diciendo nada que no supiéramos anteriormente con respecto a procesos estructurados o no estructurados, pero lo que sí que es importante y tiene que cambiar cómo nos enfrentamos a la realidad del día a día de la Gestión de Servicios es que, siendo conscientes de que existen estos dos mundos, debemos aplicar diferentes métodos para su gestión... Lo esencial que nos cuenta este libro es que debemos tener una serie de patrones que nos ayuden a movernos en los dos entornos. Find out about Rob's other books here.